Discussion in 'Graphics and Semiconductor Industry' started by DavidGraham, Jan 7, 2019. Relative to the power of even budget GPUs, it's not a lot of work. Relative to the power of GPUs someone who cares about GSync would buy, it's nothing. You are correct, but that's quite stupid as well. Variable refresh rate is something that enhances the experience on every performance tiers, so it shouldn't have ever been a "premium feature" in the first place. This is not like having a large VRAM pool where only high end cards could make use of it, or raytracing hardware that would weigh too much on low/mid-end cards. Anyone can benefit from not going down directly to 30 FPS if the hardware can't maintain the framerate above 60FPS (or dealing with terrible tearing). I bet even the 15W 4C+GT2 Ice Lake is going to be great for gaming on UMPCs or surface-like tablets. 1TFLOPs GPU + >50GB/s from LPDDR4X + variable refresh rate will rock at 720p-900p. I highly doubt that, NVIDIA had to scale their GSync HDR module to insane complexities in order to support those features, a process they wouldn't do if it wasn't absolutely needed. I have my doubts, remember "Hey mother board makers SLI is only possible if you buy a controller chip from us and put it on your boards"
everyone (apart from asus) said "Er I think we'll pass" and as if by magic Nvidia engineers suddenly discovered sli would work without the chip possibly the same magic that put a " dont disable sli on boards that manufacturers have paid Nvidia money whitelist" in their drivers. Silent_Buddha, entity279 and BRiT like this. Silent_Buddha, Kej, DavidGraham and 3 others like this. emember "Hey mother board makers SLI is only possible if you buy a controller chip from us and put it on your boards"
Totally different beasts, the level of variables required here are too many (HDR1000 + 120Hz + VRR (1-120Hz range) + Full Array Local Dimming + variable overdrive). In your CF example, multi GPUs has already been shown to work without a specific controller, and it was obvious that NVIDIA was making a marketing stunt. This is not the case with GSync HDR. The new complex GSync HDR module already costs 500$ alone to make, a complexity that is required to handle all those variables. Also there are no VRR monitors supporting those features without a module. Monitor manufacturers are going to need to beef up their controllers if they wish to offer the same level of feature support. Some users have been wondering as to why their card is not supporting adaptive sync, as it turns out now anything with a Maxwell GPU or older will not be supported. So that's pretty much the GeForce GTX 980 Ti and anything below. Yeah I believe only Pascal and later supports Adaptive Sync. According to Hardware Unboxed who tested a bunch of their Adaptive Sync monitors (all worked flawlessly), the Nvidia implementation doesn't support HDMI. VRR with Adaptive Sync monitors is only available over DisplayPort. AMD does support VRR over HDMI. The Nvidia implementation doesn't support HDMI. VRR with Adaptive Sync monitors is only available over DisplayPort. AMD does support VRR over HDMI. Yeah, I read HDMI support wasn't going to make it the first round though may be added in future drivers. The new complex GSync HDR module already costs 500$ alone to make, a complexity that is required to handle all those variables. .
Hmm so that would make it more expensive to produce than most (if not all?) the gpus than nVidia sells to gamers. Source for this? It's an FPGA from Altera (Intel), it's called Arria 10 GX 480, and comes with 3GB of DDR4-2400 RAM. It's sold separately online for 2000$. But PCPer estimates the cost on NVIDIA to be around 500$. DRAM from Micron can also be spotted on this G-SYNC module. We can confirm that this is, in fact, a total of 3 GB of DDR4-2400 memory. Maybe my phrasing was wrong. I know of FreeSync 2 HDR. I didn't follow how it actually performs though. And for now, I don't even care. I'd buy into HDR tech once it matures more.. in 2 years maybe. For that hypothetical extra 500 $, G-Sync HDR better be miles ahead of their competition by then. Also, wouldn't hold my breath. We already have it and have had it for quite some time, it's called FreeSync 2 HDR. When held to the standards of the top features in a monitor, it's called barely there. Till this moment there is barely any FreeSync 2 monitor with HDR1000 + LFC, let alone the other features (Full Array Local Dimming + 144Hz + variable overdrive). I am all for a cheap monitor with those features, I would buy it in a heart beat, but the fact is: they are not available outside of these ridiculously expensive GSync panels. So I am to wait till further notice. Gsync + Freesync displays work together without issues. My 4K 60hz monitor can do 32-60 hz range without issues, freaks out if I set it to 30-60 (can't handle LFC). pharma, DavidGraham and BRiT like this. Have you tried fullscreen windowed? rtings.com has a new article up. Note that this driver technically implements the VESA Adaptive Sync standard, not FreeSync. FreeSync is the proprietary AMD implemenation of the VESA Adaptive Sync Standard. 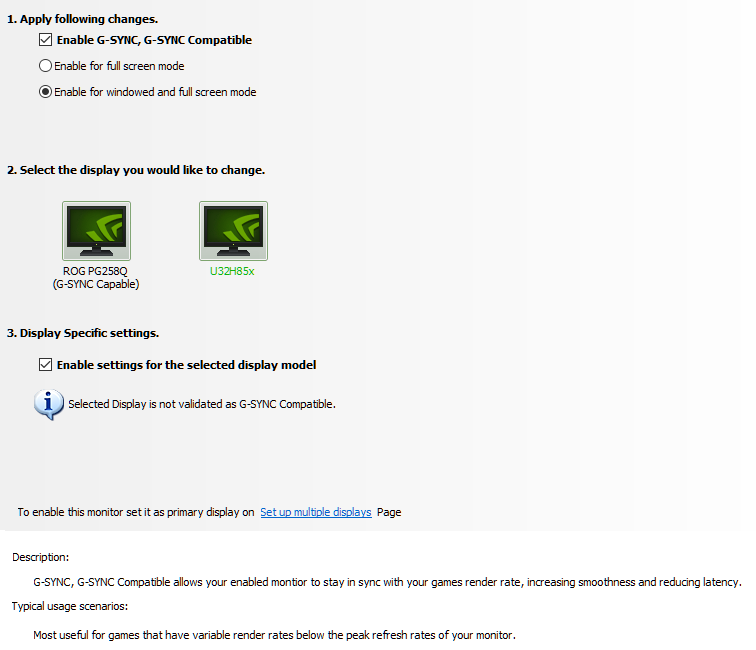 Since both use the same standard, this allows NVIDIA cards to work with FreeSync monitors. In this article, we use FreeSync instead of Adaptive Sync for simplicity sake. Silent_Buddha, pharma and DavidGraham like this.